Chocolate and bacon – two of my favorite things ever. And they aren’t as distinct from each other as one might initially think (those people who dip bacon strips in chocolate really aren’t crazy!). The dark-chocolate richness of the unsweetened – and antioxidant-laden – raw cacao and the salty savoriness of the bacon meld gorgeously in these fudge bars. While coconut oil gives them their silky, melt-in-your-mouth consistency, pure maple syrup stands in for processed sugar to give just the right amount of sweetness. All in all, it’s a decadence you can feel good about! To cook the bacon, I followed this oven-roasting method from Ina Garten. It was my first time cooking bacon in an oven, and I am telling you, it converted me! It was so easy; the bacon turned out perfectly crispy while still being incredibly flavorful, and it was a cinch to clean up – I just balled up the foil and threw it in the garbage (instead of having to drain bacon grease into a mug and having it harden in the fridge so I could properly dispose of it and then scraping at a bacon-blackened frying pan and getting nowhere and having to soak it overnight . . .). 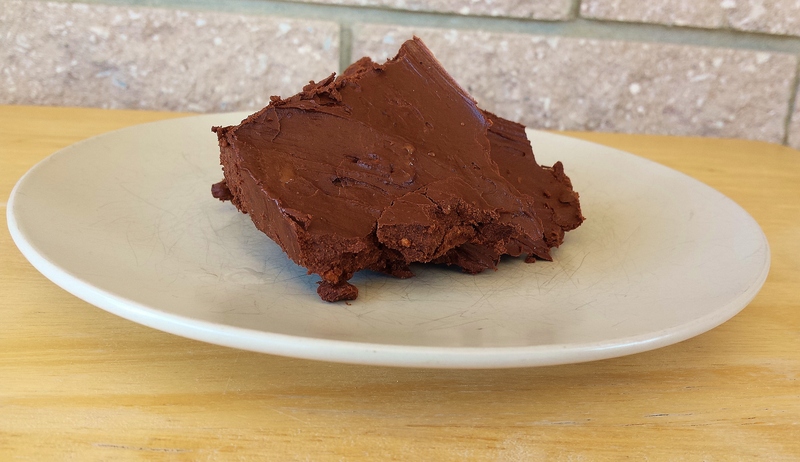 One other thing to note: this fudge is difficult to cut into uniform bars. When the coconut oil hardens, it really hardens! I’m not sure if it would be easier to cut the bars after only letting them sit in the fridge for an hour; I let mine harden overnight. I did find that running my knife under hot water for ten seconds seemed to make it a little easier, so I did the same thing with the metal pie spatula that I used to get the cut bars out of the pan. Cook bacon in a baking dish lined with aluminum foil in a 400-degree oven for 15-20 minutes, or until bacon is golden-brown and crispy but not burnt. Transfer to a plate covered with several layers of paper towel and pat with paper towel to remove excess grease. Let cool. In a bowl, combine coconut oil, cacao, maple syrup, and vanilla extract until well-blended. The consistency will seem fairly thin at first but will thicken as you mix. Crumble bacon into tiny pieces and blend into the mixture. Then spoon into a small baking dish or container (I used a rectangle glass storage container that is about 7.5 x 5 inches) and spread evenly. Let harden in the refrigerator for at least an hour before serving. Then cut into bars of desired size. Store leftovers in the fridge.